On the last day of October, volunteers and supporters of Shropshire Cat Rescue were treated to a delightful and informative evening at Salop Unison Club, when John Crane of Cato Crane Auctions offered us a glimpse of what really goes on in the country’s auction salerooms. His fascinating talk, entitled “All Things Auctioneering”, lifted the curtain just a little on some of the everyday working practices which go to make up this most interesting of occupations, providing a realistic counterpoint to the glib assertions which regularly are trotted out on those television programmes which focus on the subject. 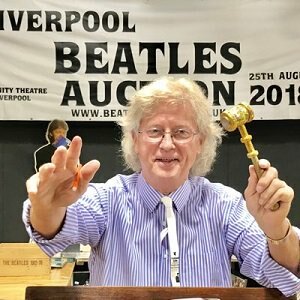 With family roots in Shropshire, and a thriving auction business based in Liverpool, John, ever the consummate professional, was able to draw upon a lifetime’s experiences to offer a true picture of what really goes on behind the scenes. All this presented with what can only be described as an undoubted theatrical flair which kept his audience spellbound throughout. Following his presentation, questions were taken, and members of the audience were invited to submit such articles of interest as they had brought along for appraisal, this “Antiques Road Show” format generating a lively discussion amongst those in attendance. With refreshments available throughout the evening from the Club bar, together with the sale of raffle tickets, the event proved thoroughly enjoyable for all concerned and some £100.00 was raised for S.C.R. Funds. The event closed with thanks extended to John Crane, who had driven down from The Wirral for the occasion, by Marg Lloyd on behalf of The Trustees and Volunteers, all of those present having very much enjoyed a fine evening’s entertainment.